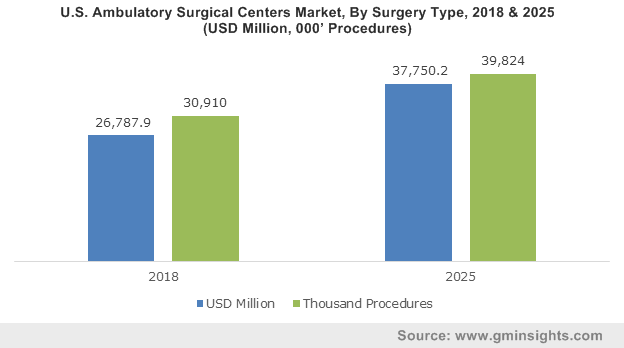 Ambulatory Surgical Centers Market size was valued over USD 67 billion in 2017 and is expected to witness around 5% CAGR from 2018 to 2024. Technological advancements leading to the development of sophisticated diagnostic and therapeutic devices that enables the management of diseases at low cost will drive the ambulatory surgical centres market growth over forecast period. Technological advancements can significantly cut the cost of healthcare services and improves the treatment results. Such devices enable ambulatory surgical centres to offer healthcare services at a significant less cost boosting the industry growth. Increasing incidences of trauma and accidents requiring surgical treatment will serve to be a high impact rendering factor. As per International labour organization, around 340 million occupational accidents are recorded every year across the globe. Furthermore, demand for surgeries is also supported by rising prevalence of chronic diseases such as cardiovascular diseases, diabetes and cancer. Demographic trends such as rising geriatric population and changing lifestyle habits in developed as well as developing nation are expected to escalate incidences of chronic diseases. As the ambulatory surgical centres offers superior healthcare services at affordable cost, increasing demand for surgeries will drive the industry expansion over forecast timeframe. Physician only segment dominated industry with the market share of around 50% in 2017. The reason can be attributed to highest professional control exerted over clinical environment and the quality of service in physician owned centers. Greater convenience associated with physician owned centers as the physician can schedule procedures as per the convenience of patients will further augment segment growth. Physician and hospital segment is forecasted to witness 4.4% CAGR over the forecast timeframe due to rise in the demand for treatment of multiple diseases. The demand is further fueled due to increasing incidences of viral fungal and bacterial diseases resulting in different clinical conditions. The segment is further forecasted to grow as partnership eliminates the barriers limiting treatment to few disease only and enabling treatment of wide range of clinical conditions. Ophthalmology surgeries segment generated revenue more than USD 12 billion in 2017. The segment currently dominates the industry due to stupendous rise in the incidences of eye related diseases such as night blindness and cataract. As the geriatric population segment is vulnerable to eye diseases, rising geriatric population will contribute to the increasing incidences. Increasing demand for eye surgeries for management of aforementioned diseases will fuel ophthalmology segment growth in foreseeable future. Highest number of procedures were conducted in the field of endoscopy in 2017. High prevalence of gastric diseases such inflammatory bowel disease, ulcerative colitis and colorectal cancer in developing as well as developed nation drives the volume growth. However, lack of healthcare infrastructure and limited affordability and accessibility for endoscopic procedures will hamper the segment growth to some extent. Single specialty centres held over 50% of industry share and the trend is likely to remain so over the forecast timeframe. Single specialty centres efficiently improve patient’s health by providing customized treatments whenever necessary. The increasing demand for specialized care in several chronic diseases like diabetes, ophthalmic diseases and other minor injuries will augment segment growth. Multispecialty segment is forecasted to grow at a robust CAGR of 4.8% from 2018 to 2024. The robust growth is attributable to the increasing medicare spending for surgical operations such as hysterectomy coupled with several benefits associated Multispecialty ambulatory facilities. Treatment segment accounted for more than 75% of industry revenue share in 2017 due to rising demand for minimally invasive surgeries that are carried out at the ambulatory surgical centres at affordable cost. Rising prevalence of chronic diseases such as cancer, favourable demographic trends, sedentary lifestyle, lack of exercise will further augment the demand for effective and affordable treatment rendering significant positive impact on segment growth. Increasing awareness pertaining to the benefits of early diagnosis such as early recovery from the disease will augment the demand for superior diagnostic techniques. As early diagnosis can significantly reduce the cost burden on healthcare system, the government authorities across the globe is taking initiatives to promote diagnosis of several life-threatening conditions such as cancer at early stage. This is predicted to augment segment growth. U.S. market was valued at over USD 25.5 billion in 2017. Growing demand for ambulatory care and favourable demographic trends will drive the regional growth over the forecast period. High per capita income, technological advancements, and developed healthcare infrastructure will propel industry growth. Germany accounted for more than 25% of European market share in 2017. Increasing demand for surgeries such as eye surgeries and skin surgeries support the industrial growth. Moreover, technological advancements that enables ambulatory surgical centres to provide healthcare services at affordable cost will drive regional growth over forecast period. 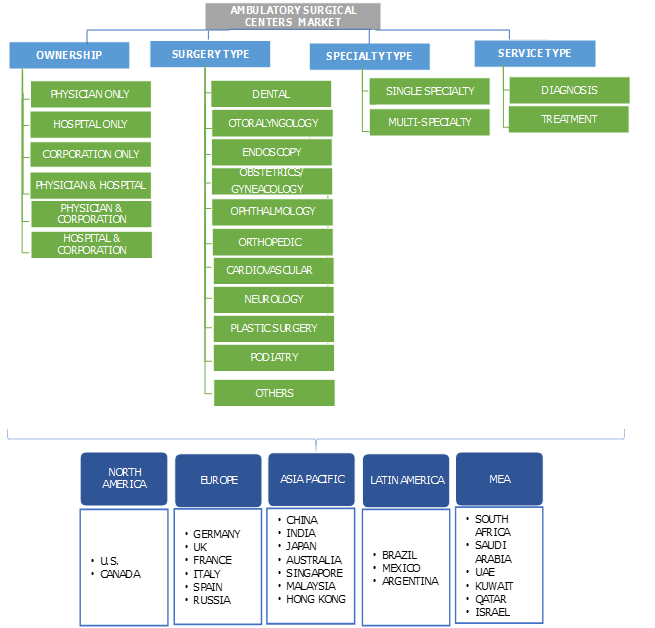 Some of the notable players operating in the global market are Hospital Corporations of America, Ambulatory Surgical Centres of America, Physicians Endoscopy, Proliance surgeons, Surgical Care affiliates, AmSurg, Surgcenter Development, ASD Management, Regent Surgical Health, Covenant Surgical Partners, Surgical Management Professionals, Surgery Partners and Tenet/USPI. Industry players are adopting various growth strategies such as partnership and collaboration for retaining the market share. Advent of new technologies coupled with growing prevalence of chronic diseases across the globe will drive the ambulatory surgical centers market growth. Rising awareness pertaining to the benefits of ambulatory surgeries will further augment the growth over forecast periods. The technological advancements leading to the development of superior quality devices that provides better service at affordable cost will be a high impact rendering factor. Positive reimbursement scenario, rising disposable income coupled with various strategic initiatives taken by the players in industry will impact industry growth.